Inspired by David Valdez’s glowing review of it, I’ll put in my two cents on this light. 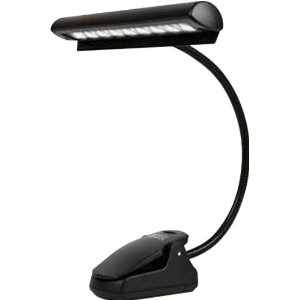 If you are looking for a portable, BRIGHT light for your music stand, get this. It is amazing. I’ve been using this for a few months, and I have nothing be good things to say about it. It comes with a case, AC Adapter, and 3 AA batteries. All for about $42 on Amazon. 100,000 hours of life in the LEDs. Comes with batteries, which last something like 20 hours, and a AC adapter with a really long cord. And it’s cheap? Get it. Now. Click. Buy. Ship. Enjoy.